Snapchat is a messaging social media platform that was founded in 2011 by Stanford student Evan Spiegel. Unlike other apps like Twitter, Facebook, and Instagram, the core communication on Snapchat happens between individuals. Although users can now broadcast longer form pieces of content to a wide audience, Snapchat’s roots are as a messaging app rather than a publishing app. Social entrepreneur Gary Vaynerchuk said that the way “Snapchat works is much closer to how we communicate face to face than any other social network.” It’s true if you think about it. Are you more likely to compose a concise, witty quip to share with your friend or tell her about the carrot that looked like a person at the grocery store? Snapchat has had an explosive adoption rate, especially among teenagers as many as 60 percent of smartphone users in the U.S. aged 13 to 24 use the app. Mashable explains that we like the platform so much because it promotes authentic communication, is easy to use, and is fun. A baby among social media networks, Snapchat has come a long way in the past five years. Here’s a fun visual history of the young social network. It’s one thing for teenagers to flock to a new app, but what does this mean for brands and marketers? Well, teenagers being on the platform is a critical draw for many brands who want to grow a base of loyal customers. The challenge is to break through the barrier of the teenage subculture. Content Marketing Institute explains that brands have a few different options for using Snapchat to engage with their target audiences. In addition to creating interesting, engaging, on-brand content, companies can work with a celebrity who already has a strong presence on the social network to promote the brand via snap picture or video. Brands can also sponsor user-generated stories by purchasing ad space. So which brands are doing a good job? When you think of brands doing a good job on Snapchat, the company that makes light bulbs probably isn’t the first one to come to mind. Despite the fact that GE is a giant, global company with brands in a variety of industries, it has found a niche on the network. Instead of trying to cover all the possible topics related to its brand, GE focuses on one core idea that relates to the entirety of its business: science. The content followers received included clips like this one with celebrity science guy, Bill Nye. Another key to success on Snapchat is fresh content. The platform is innovative and surprising, so brands that thrive create content that reflects that. One GE campaign that used both the element of surprise and a celebrity spokesperson was when astronaut Buzz Aldrin appeared on the account. 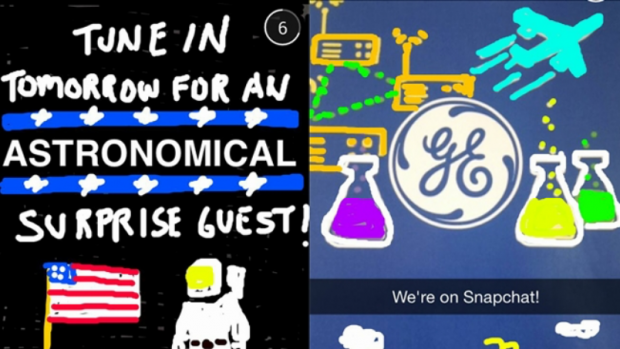 What core idea would your company use as the basis for Snapchat content? I am employed in the nursing home industry and must be extremely careful about HIPPA guidelines. One aspect of Snapchat that we can use is have our residents use Snapchat to visit with grandchildren who live far away. Snapchat could also be used as a method to tour the facility for a short period of time. I feel like when it comes to privacy, Snapchat still has some work to be done. I know most people record anything and everything with Snapchat, even without the consent of others who are featured in those videos. It seems to be an issue, but it’s hard to see how the company could prevent this from happening. I really feel that brands should care about a platform such as Snap Chat due to the fact that it has grown to become so popular as of late. Teens today use this app more than they text and some use it is their primary form of digital communication. I feel that utilizing this platform will allow companies to harness even more brand recognition! I think brands are really understanding that Snapchat is a platform that is taking off and they need to be a part of. On the app you notice the ‘featured’ and ‘live’ videos, along with some brands having their own filters. Also if companies are trying to target millennials, Snapchat is definitely a way to go. When I mentioned last week about social media influencers they are the ones who are using this platform. The only thing I hate is there is no way to track analytics.